Sign welcoming visitors to Bern. The town was founded in 1852. Today, more than 4,000 people live in Berne, many of them descendants of the Swiss settlers. Up until 150 years ago, Switzerland was not a prosperous country. Back then, many people went abroad in search of land, wealth and religious freedom. Some emigrants founded settlements and named them after places in their old homeland. This is why we find e.g. Bern, Zurich, Fribourg and more all over the world. Migration is a topical issue. Many people are seeking a better life in Europe, including here in Switzerland. Yet emigration in the 19th century flowed primarily in the opposite direction – from Switzerland, which was mainly an agricultural country, to other continents. Some cantonal authorities supported this exodus, in part because it allowed them to get rid of unwanted, impoverished citizens. In other cantons, however, emigration was forbidden. Agencies and individual peddlers lured in customers with false promises. Often they themselves profited and the emigrants were plunged into ruin. The colonists were also regularly used as political pawns. Many a government promised that European settlers would help drive out indigenous peoples – whether native North Americans, native Latin Americans or Tatars. Climate catastrophes, agricultural crises as well as societal and economic changes also contributed to emigration. The textile trade in Switzerland was industrialised early on. After France’s economic blockade against England was lifted, the Swiss market too was flooded with cheap textiles. Jobs, especially home-based and artisanal work, were lost. When Mount Tambora erupted in Indonesia in 1815, massive amounts of ash dimmed the sunlight even in Europe. 1816 went down in history as the “year without a summer” and led to crop failures. This resulted in price increases, mass poverty, famine and emigration. 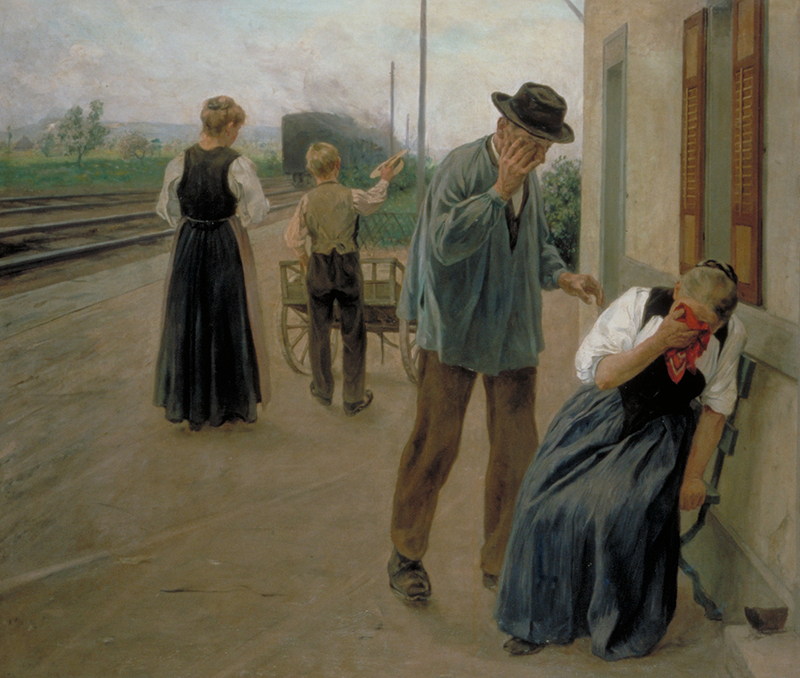 Artist Hans Bachmann explores the subject of emigration in this painting from 1911. The Swiss colony Nova Friburgo in Brazil was established during this period. The deal between the Fribourg cantonal government and the Portuguese king in Brazil was sealed on 16 May 1818. Over 2,000 people, mainly from Fribourg but also from other cantons, volunteered to emigrate. “Rootless” individuals were deported by the authorities. Brazil was keen to find workers, as the abolition of slavery was underway. The Swiss were said to be good craftsmen and soldiers. In addition, the immigrants were intended to make the South American country “whiter”. The king himself allocated land some 150 km inland from Rio de Janeiro to the settlers. The hilly terrain and climatic conditions were supposed to be similar to those of the Alpine foothills in the homeland. The colonists received some land, temporary housing and ten years’ tax exemption – those who survived the journey to South America, that is. The Fribourg government minister and emigration organiser was namely a profiteer who pocketed most of the money for himself. Not only did the emigrants have to wait for weeks in Holland under appalling conditions for the ocean-going vessels to arrive, but the strain of the long crossing and the difficult journey inland also took a toll. Moreover, it soon became apparent that the steep stony terrain in Nova Friburgo was unsuitable for agriculture. The settlers were free to choose whether they wanted to stay or cultivate more fertile land a little further away. After several years, some of the Swiss settlers managed to successfully grow tobacco, sugar cane and coffee. Citizens of Nova Friburgo made a living from the nearby coffee plantations and later the textile industry. Today, Nova Friburgo is regarded as the undergarment capital of Brazil. 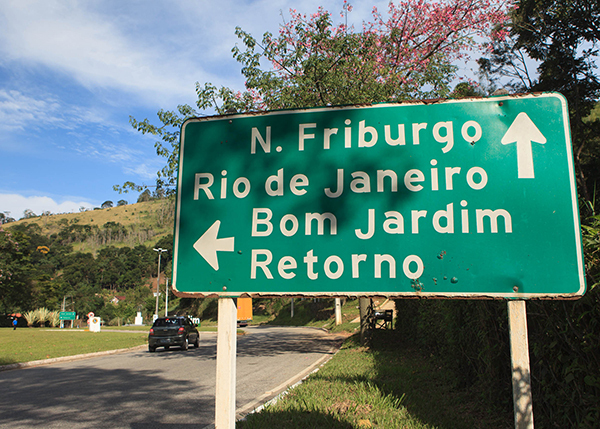 Nova Friburgo is located approximately 150 kilometres from Rio de Janeiro in the Brazilian hinterland. 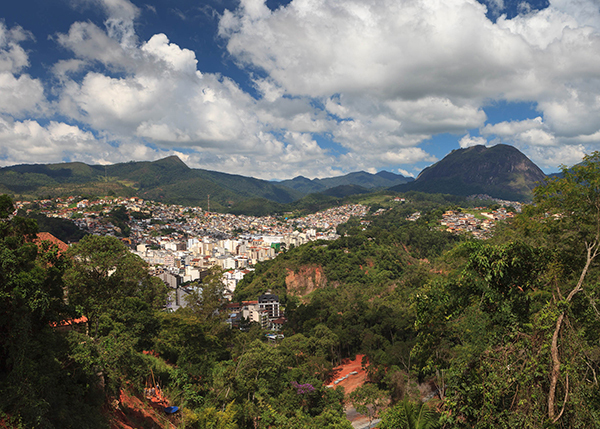 Nova Friburgo is regarded as the undergarment capital of Brazil. The textile industry has created some 20,000 jobs in the region. The founding of the Zurichtal settlement in Crimea took place against the Zurich authorities’ will. In the late 18th century, the rural population was under the control of Zurich’s “great lords”. Emigration was forbidden. After several prosperous years, however, the textile and weaving industry was in a sad state. Many weavers, spinners, farmers and craftsmen wanted to escape poverty. At the time, the “New Russia” settlement was being promoted; in 1783 the peninsula was annexed by the Russian Empire. The tsar promised land, tax abatement and exemption from military service. Thus, in 1803 about 60 emigrant families secretly set off on the Danube towards the Black Sea with Major Hans Caspar Escher, the grandfather of Alfred Escher, at the helm. 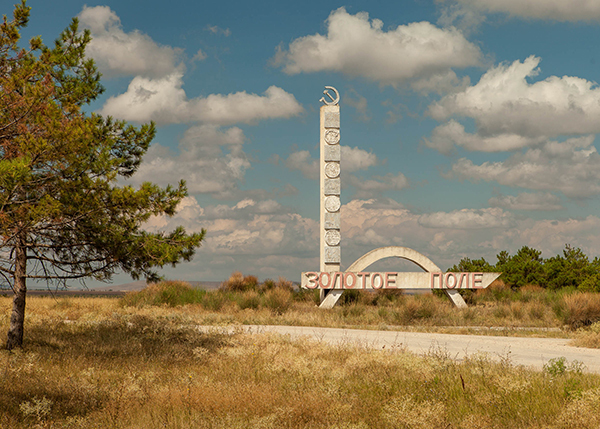 After a long, arduous journey through the winter, they managed to reach southern Crimea on their last legs and settled down in an abandoned Tatar village. They named it Zurichtal, built farmhouses, cultivated cropland and vineyards. German emigrants later followed. 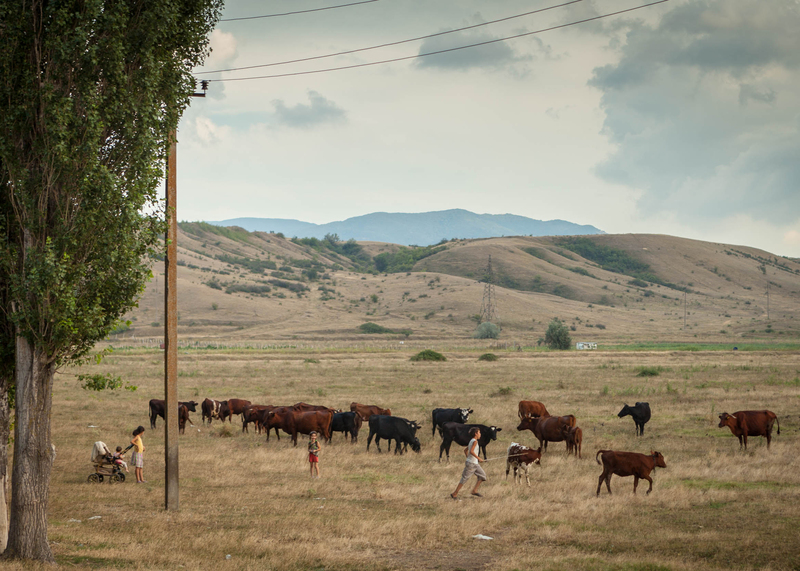 After the October Revolution in 1917, the village became a state-owned farm, or sovkhoz. Around 1930, the repression of the Crimean Germans and Crimean Swiss began. They were forced to hand over their harvests, houses and money and were deported to Siberia. In 1945 Zurichtal was renamed “Zolotoe Pole” – the golden field. Today it is inhabited by Crimean Tatars, Russians and Ukrainians. Only a few farms and gravestones that were not used to build garden walls serve as reminders of the Swiss founders. Zurichtal was renamed Zolotoe Pole – the golden field – in 1945. Today not much remains of the former Swiss colony. The “golden field” serves primarily as pasture land for the few remaining inhabitants’ cattle. The Swiss heritage of the town of Berne in the Midwestern United States, on the other hand, is still clearly visible. The Muensterberg Clocktower is an exact replica of the Zytglogge tower. The First Bank of Berne is built in the Swiss Chalet style. Numerous Swiss surnames are emblazoned on posters and business signs. In the mid-19th century, the quest for religious freedom and exemption from military service led to the founding of Berne. The Mennonite religious community in Switzerland led a secluded life on isolated farms, practiced adult baptism and refused to serve in the army. Although they were no longer officially persecuted, in 1852 about 70 Swiss Mennonites from Moutier in the Bernese Jura set off for America. They found cheap land in the state of Indiana. Much of it was wilderness and swampland. The emigrants cleared the land, struggled to fight off bears, wolves and diseases. Later, when the railroad was built, the settlement became connected to the outside world. In 1871 the town was officially registered as “Berne”. The settlers culivated the land and worked as craftsmen. Berne became the furniture capital of Indiana. 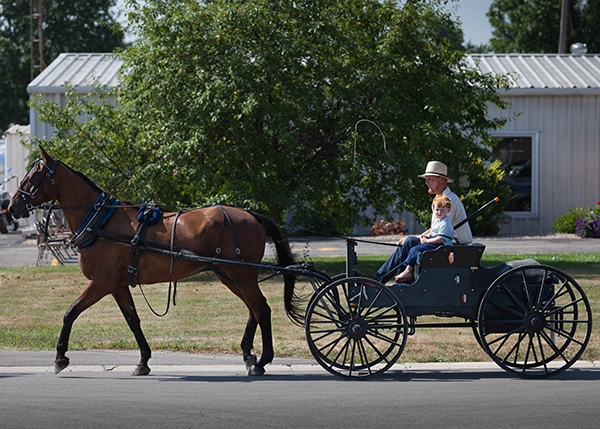 Amish families settled in the surrounding areas. This strict religious community – whose name can be traced back to Jacob Ammann of Switzerland – lives according to the Old Testament and does not use motors, electricity or the Internet. Once in a while you can see them driving a horse and buggy through town. They generally avoid contact with their neighbours, the descendants of the Mennonite founding fathers, although both groups stem from the Anabaptist movement and have Swiss roots. 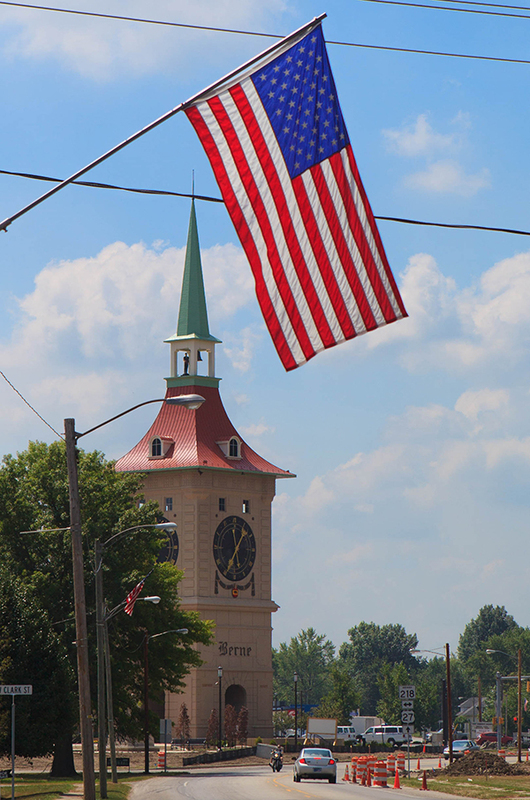 A little piece of home in faraway America: the Muensterberg Clocktower, modelled after the Zytglogge tower in Bern. A typical sight on the streets of Berne: The Amish use traditional black buggies without rubber tyres. Roughly 752,000 Swiss citizens live abroad. In reference to the country’s four language areas, they are often referred to as the “fifth Switzerland”. The Organization of the Swiss Abroad (OSA) represents Swiss expatriates’ interests in Switzerland and helps them to maintain relationships abroad as well as with people at home. The exhibition, developed in collaboration with OSA, looks at the history of the Swiss abroad with a special focus on the life histories of individual emigrants, in the past as well as today. 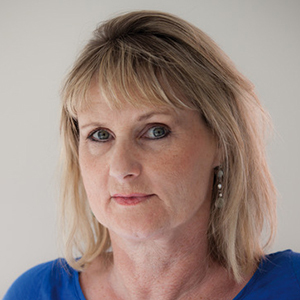 Petra Koci ist freie Journalistin und Autorin. In ihrem Buch «Weltatlas der Schweizer Orte» porträtiert sie von Schweizern gegründete Siedlungen auf fünf Kontinenten.